All transactions are safe and secure with a reliable history in online purchasing behind each of our associates. 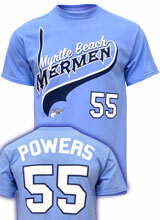 Buy the Myrtle Beach Mermen t-shirt to own Eastbound and Down clothing and merchandise. Cheer on Kenny Powers in this Eastbound and Down t-shirt that features the logo for his new team. In hopes of getting back into the pros, he joins the Myrtle Beach Mermen after finding success in Mexico following an unauthorized offer from the Tampa Bay Rays, which left Kenny in the dust. Wear this Myrtle Beach Mermen t-shirt that looks nearly identical to the Kenny Powers baseball jersey seen on the show. In addition to the Myrtle Beach Mermen tee above, browse the Eastbound and Down Clothing Gallery for more apparel like men's and women's clothes, kids shirts or hoodies.